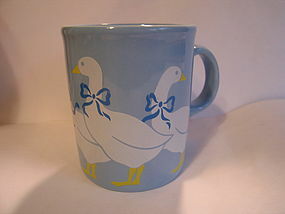 Vintage blue mug with 3 geese with ribbons around their neck. To be accurate, this is a blue blue goose mug. It is 3 3/4 inches in height. The bottom is marked "Made in England." Very little sign of use. I need your zip code to calculate the postage.